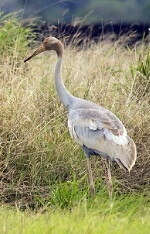 Australia has two cranes, the Brolga Grus rubicunda and rarer Sarus Crane Grus antigone. The Brolga is New Guinea's only crane, living mainly in the Trans-Fly lowlands of Papua New Guinea and Irian Jaya, Indonesia. Although Brolgas have occasionally been recorded in the Torres Strait, there is apparently no regular migration or interbreeding between New Guinea and Australian Brolgas. The Sarus Crane occurs in India, South-east Asia and Australia. Genetic studies indicate it's more than 30,000 years since Australian Sarus Cranes interbred with Sarus from SE Asia, and there is no known migration of Australian Sarus outside northern Australia. Both are tall, elegant, slow-moving grey birds with long legs and bill and a broad wingspan. Their distinctive calls are known as trumpeting or bugling. Sarus Cranes are slightly larger (though slightly lighter in weight), and appear greyer with extensive red on the head and neck. Sarus legs are pink to reddish. Brolgas appear paler grey, have much less red on the head, blackish legs and a dark pouch or dewlap bulging under the throat. Cranes enhance the volume of their calls with a coiled trachea that resonates in the sternum. The image is from Edward Blyth (1881) The Natural History of the Cranes: the bird was an adult male (Indian) Sarus that died in the London Zoo. Listen to short calls of Sarus Cranes» and Brolgas» on Ozcranes. Long calls of Australian Sarus and Brolgas in the field can be played for comparison at New Zealand Birds Online. 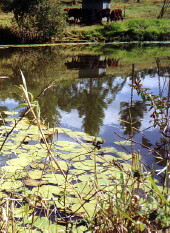 Listen to a Sarus Crane calling near the Curtain Fig, Yungaburra, Atherton Tableland. VIDEOS: Brolga making single calls while walking through swamp; Indian Sarus unison call at the nest (YouTube). DistributionNorthern and eastern Australia, except Tasmania. In New Guinea, southern central lowlands of PNG and Irian Jaya Province, Indonesia; plus some along the Sepik River in the north. Sometimes seen flying on islands in the Torres Strait but no known migration or interbreeding between Australian and New Guinea Brolgas. There is almost no information about the New Guinea population. Brolga photographs from Wasur National Park, West Papua, Indonesia: one Brolga in 1991 and a small flock of four in 2007. In Australia, breeding is only well-documented in the Riverina and SW Victoria/ SE South Australia districts, where Brolgas are threatened and intensive nest searches are done. Nest searches in the tropical north are difficult due to flooding seasonal rains. Brolgas are no longer listed as an occasional vagrant to New Zealand, as the identification of cranes recorded there is now considered uncertain. NumbersBrolgas in Australia number at least 50,000 and possibly up to 100,000, but there are no figures for New Guinea. More in Brolga FAQ 1». 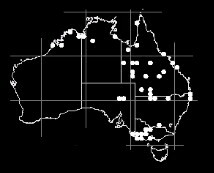 DistributionAustralian Sarus Cranes are mostly concentrated as shown, in far north Queensland and the far NE of the Northern Territory. 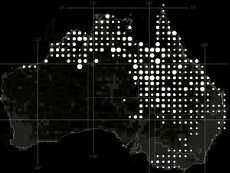 Occasional records occur S of the area shown, and across the Top End. Sarus also occur in India and SE Asia. There is no evidence of Sarus migration between other regions and Australia. 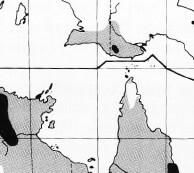 Breeding is only documented in the Gulf of Carpentaria (large dot on the map, which is courtesy BirdLife Australia). HabitatsBrolgas and Sarus Cranes are wetland birds, needing water every day to drink and bathe. They breed as isolated pairs in swamps, dams and floodplains in the rainy season (summer in N Australia and New Guinea, winter-spring in S Australia). The dry non-breeding period is known as the ‘flocking’ season, when (at least for a significant part of the population) pairs and their (one or two) young join many others in feeding and roosting flocks. In N Australia, flocks can contain both species, usually with one predominating. There are many unknowns around why one species predominates in some areas, differences in preferred nesting habitat, and the extent of competition and interbreeding in the wild. More on habitat differences in Sarus Crane FAQ 3» and on competition/ interbreeding in Ozcranes Research. 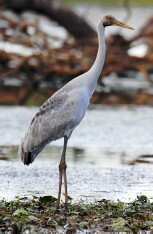 ConservationWorldwide, cranes rely on wetland health and a good relationship with people to survive. With some exceptions, there are a lot of positives in Australia. 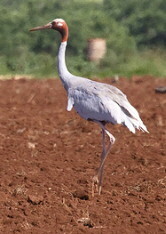 Brolgas and Sarus Cranes are widely respected across the pastoral rangelands or farmlands where they nest, and later feed and roost in flocks. The birds keep coming back, implying many properties are managed positively for Brolgas and Sarus Cranes. For more on habitat and conservation, continue on to Ozcrane Brolga and Sarus Crane FAQs, and check Ozcranes Conservation» pages. In the FAQs, Brolga conservation is covered in Brolga FAQ 3» and for Sarus Cranes, see Sarus FAQ 4». Practices that achieve crane-friendly land management, and relevant research, will be regularly featured on Ozcranes. We welcome contributions from landholders, catchment groups and others with experience in managing wetlands and other habitats for production and cranes. Crane images from HANZAB2, artist JN Davies. ↑ The young can be much harder to distinguish in the field, especially at a distance.